Cliffs loom above a pretty field of wild poppies near Moustiers Ste Marie in France. A cheerful sight, a mass of wild poppies otherwise known as "Coquelicot" in France. The silky petals wave gracefully in the light breeze like a symphony. Although wild poppies are considered more of a native wild flower or an indigenous weed, they sure are a delight to see when clustered together in a field beneath towering cliffs of rock, creating a contrast of colour and landscape. Wild poppies grow in various colours including vibrant, bright red, pinks, whites and sometimes even grayish-mauve shades. 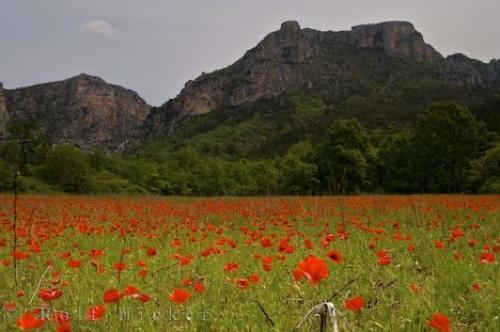 Photo of a field of wild poppies in the Alpes de Haute region of the Provence, France.